ZAQ Ultrasonic Scrub Device will help to enhance your skin-care regimen, leaving your skin looking and feeling refreshed. ZAQ technology generates ultrasonic vibrations that will exfoliate and refresh your skin. Ultrasonic skin scrubber is the most popular with beauticians among multiple instruments.Its shifts electric vibration with 24000 times per second to mechanical vibration with thousands upon thousands times per second. 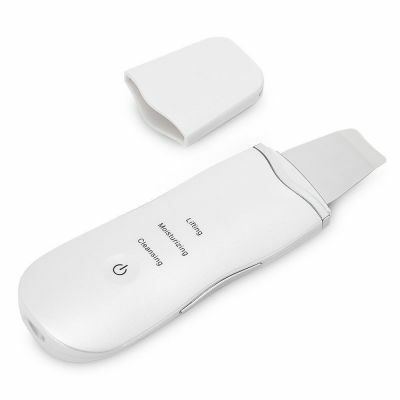 Penetration effect of ultrasonic gives skin massage as well as cleansing. A stone known for its powerful soothing properties to the mind and emotions, this is a gem that can calm sleepless nights and restless days. Historically, this gem was ranked high amongst the diamonds in value and cost. Noted among religious societies, the Hebrew tribe of Dan gave Amethyst the honor of 9th stone on the breast plate of the High Priest as well as the twelfth foundation stone in New Jerusalem. Egytians listed the stone in their Book of the Dead to include a heart-shaped amethyst stone in burial rights. It illustrates its vast usefulness by earning the name of “Gem of Fire” while belonging to the water-god Neptune and being steeped in lore around the god of wine, Bacchus. This versatile stone ignites the fiery passion of creative, while holding strong ties with logic, sobriety, and temperance. Revered for its ability to curb over-indulgence, ancient Greeks and Romans would line their chalices with the stone to belittle the intoxicating effect of the wine they drank. More modern-day usages include tempering evil thoughts and self-piety. Some even believe the stone to be powerful enough to protect against psychic attacks or induce heavy states of meditative trance. It can be included in meditations to still the mind, enhance meditative states, create an aura of protection around the body in the form of light, and stimulate wisdom. Some medical studies have been performed to validate its effectiveness in treating arthritis, tinnitus, insomnia, and headaches. Use on the face: If you have a big project coming up, struggle with anxiety, or participate regularly in a yoga practice, look no further for your roller. Indulge in the Amethyst stone to reduce overindulgence in vices and improve willpower. Said to create a connection directly to the Divine, use this unique stone first thing in the mornings as your mind transitions to a wakeful state to begin your day. Enhance your dream abilities by including the roller in your nightly face routine, paying special attention to the third eye. 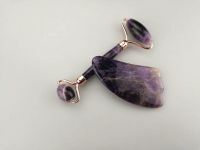 Run the amethyst stone over the space above and between your eyebrows to improve cognitive perception, psychic abilities, and lucid dreaming. Holding the roller in the left hand can encourage meditative endeavors. Saying a quiet prayer while using the stone can assist with stilling the thoughts and receiving the power of the Divine. Daily usage of this stone roller is sure to spark creativity, passion, and intuition. Take a break from projects or schoolwork for a quick, rejuvenating mini-face massage. Regular use will give way to original thoughts and creations. Used in the middle of the forehead, amethyst calms and soothes neural signals, relieving hyperactive activity, insomnia and nightmares. This unique stone can also be utilized to curb bad habits. Use daily when quitting smoking, drinking, or drug use to encourage full restoration to your balanced self. Amethyst has also been found to increase hormone production, stimulate the sympathetic nervous system, increase oxygenation in the blood, and reduce bruising. Regular use will benefit the entire body. Emotional disruptions such a worry, feelings of being overwhelmed, tension, and anger can be soothed away one roll at a time. ZAQ Amethyst Roller over target areas. Use wider end on face, neck and body. 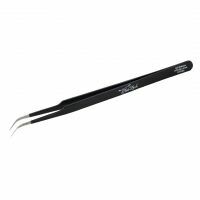 Narrow end is designed for use under and around the eye area. Can be used throughout the day as desired. Use after topical skincare application to maximize benefits. Store your Amethyst Roller in the fridge to help keep puffiness at bay. The stone is naturally cool, but the soothing effect of the chilled Amethyst is an at-home, spa-level experience. To clean your Amethyst Roller, wipe gently with a damp cloth and towel dry after each use. ZAQ Mellow Silicone Facial Cleansing Brush with ROHS and CE certifications, it`s safely and harmless to the human for normal skin, we recommend to use it as daily routine. for sensitive skin, we suggest to use once a day. This facial cleansing brush can effectively remove cosmetics residues, cutin, dead skin cells, acnes and dark head and diminish pores. New dual-core W-SONIC vertical skin sonic pulsation technology can release 8000 sound waves per minute. With 5 adjustable strengths, it is suitable for different ages and skin types. The skin cleansing system works by gently directing lower-frequency pulsations on wrinkle-prone area to help diminish the visible signs of aging, increase the blood circulation, increase the absorption of skin products，lift and firm your face. SPECIALLY DESIGN FOR SENSITIVE SKIN. The updated brush hair is softer. It is 5.2mm long, with a diameter of 1.2mm. It is as gentle as hands, but the cleaning effect increases tenfold. It is suitable for sensitive skin type. Medical grade silica gel can strongly resist bacteria, and brush head designed for T zone can effectively remove grease and stains, giving you a dustless and cool feeling. WIRELESS CHARGING & SUPER LONG STANDBY TIME. 300 minutes by charging for Two hours. Brand new inductive type charging and seamless assembly truly realize IPX6 water resistance and guarantee safe use. High-quality rechargeable lithium battery supports super long use. Small size makes it convenient for carrying when traveling or going on a business trip.